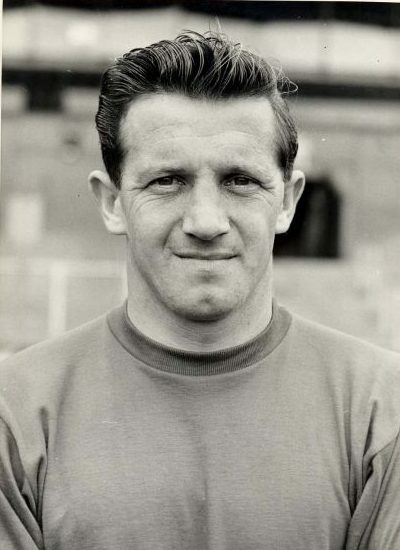 Ray Mabbutt played a couple of times for the Arsenal A team in the 1953-54 season, but after National Service found his feet with Bristol Rovers. Born 13 March 1936 in Aylesbury, he represented Berkshire & Buckinghamshire at youth level, and started out at Aylesbury United in 1953. While there he was given a trial at Arsenal in 1954. Ray appeared twice in the London Professional Midweek League for the Arsenal A Team. His first game on 24 February 1954 away at Millwall saw the Gunners win 1-0, while in his next game against Watford on 5 April 1954 he scored in the 3-2 win. After another trial for Oxford City he joined Spennymoor for 1954-55 and then the Yorkshire Amateurs in 1955 during his National Service in the army. Shortly after he was demobilised he moved South Westerly to Bristol Rovers of the second division in 1955, signing professionally in August 1956 and went on to play almost 400 times for the club. A versatile wing-half he played for the Gas in almost every position including emergency keeper and as a hat trick scoring centre forward. Consequently his whole-hearted approach meant he was very highly respected and appreciated by the Rovers supporters. After leaving Eastville in 1969 he spent a couple of seasons at Newport County, after which he embarked on a veritable tour of West Country non league sides. Joining Trowbridge Town in 1971 and then Bath City, Clevedon Town, Frome Town and Mangotsfield United. He returned to Clevedon as player manager in 1978 before going to Keynsham Town and finishing at Harptree United in 1985, then in his late forties. Father of Gary and Kevin, both professional footballers; they bridged the Bristol gap as one played for Rovers and the other City. Gary went on to be a full England international too. Ray Mabbutt played tennis into a late age, wrote a book entitled ‘You can be a Soccer Star’, and after football worked for many years in the financial sector for Investors Planning Associates in Bristol, before retiring to live in Winford. Ray Mabbutt died on 2 November 2016 in Bristol aged 80.